The "e;Funky Munky Band Goes On Tour"e; is a fictitious and hilarious journey through what most local musicians experience trying to make it big. Although this is a fictitious book, many of the struggles musicians face are very real and consequently, very funny too! As you will see. Soon after an initial jam in the town of Upharta, four musicians decide to become a band. They … are all aging and would like one last shot at touring and perhaps success. It is decided that a website would greatly aid in that cause. To keep viewers interested they adopt a "e;newsletter"e; format to keep fans engaged and to grow the ever important "e;following"e;. Oh, but this is no regular newsletter! Fun, puns, and an out and out belly laughs are the result. 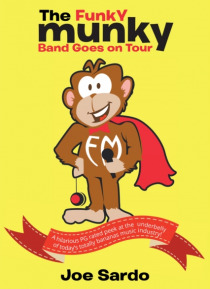 The Funky Munky Band Goes On Tour is a quick read that is guaranteed to tickle your funny bone! Seriously unserious!